You know how I feel about “single-use” kitchen utensils – with rare exception they do not make the cut in my kitchen. Which is why I love my tongs – it’s the utensil that, along with my chef’s knife, gets the most use in my kitchen. I must reach for these at least 3-4 times a week, and love this pair from OXO. The 12″ length is perfect for most tasks, and it has a locking mechanism so it stores nicely in my kitchen drawer. So, what do I use my tongs for? 1. Finishing pasta – I use my tongs exclusively to gently and evenly toss drained pasta in sauce. 2. Removing pizza from the oven – tongs are perfect for grabbing a pizza from the hot stone in the oven. It’s much easier than wielding a spatula, and I don’t have to slide the oven rack out to do it. 3. Stabilizing chicken or steak while slicing – holding the tongs on their side (like in the photo above), they keep your protein in place on your cutting board. 4. Barbecuing – this one’s obvious, right? A nice pair of long-handled tongs are essential when grilling. 5. Wilting greens – this may be my favorite use. Ever try wilting a big bunch of spinach in your frying pan, only to battle with hot greens flying all over the stove? Tongs neatly (and safely) turn the greens as they slowly and evenly wilt down. 6. Frying – if you’ve typically used a spatula to turn foods while frying and sauteing, try tongs instead. I find, especially with breaded foods, that I lose less of the coating and make less of a mess. 7. Stir fry – tongs are perfect for moving stir fry evenly around your pan – if you do this kind of cooking often, I’d suggest tongs with nylon heads to avoid scratching your pan’s surface. 8. Removing corn on the cob from a pot of boiling water. 9. Grabbing hard to reach items in your pantry. 10. Pulling baked potatoes from the oven – I bake my potatoes right on my oven rack – tongs are easier than using oven mitts for removing them. 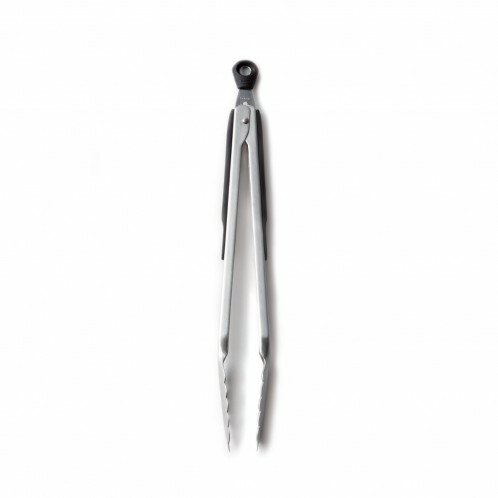 Are you a fan of tongs too? Any other uses that you’d like to add? I’d also love to know what your favorite multi-task tool is – please share! I’m 100% w/you. Tongs & 10″ chef’s knife, but I don’t like the locking type. I am also partial to my Kyocera ceramic knife. I love them for tossing kale or turning over baked French fries both of which I bake in the oven. Tongs are the best! Just saw something on a cooking show yesterday – using tongs to squeeze lemons. Stick the lemon towards the hinged end and squeeze. Going to try it soon! Okay – I love this! they are a pain to store. why hasn’t someone designed a tong caddy?